All the fun of growing indoor plants is after seeds or roots are planted. There’s the great sense of expectation of seeing the first tender sprouts poking through the soil. Indoor gardeners prefer fast growing indoor plants for the best displays. It’s important to note that plants grown from roots tend to grow faster than those grown from seeds. This is true of herbs, vegetables, evergreens or flowering plants grown indoors. Most herbs grown from seed produce sprouts in five to seven days. Root plants grown from root cuttings may sprout their first foliage in less than five days. This depends on the growing environment. If all of the needs of the plants are in place, for example, adequate heat, light and moisture, indoor plants may sprout within eight days. What generally takes indoor plants longer is the interim period between the time seeds begin to sprout and the time sprouts begin to mature. For most plants, maturity doesn’t happen overnight. There are exceptions to this. For example, the riotous Spider Plant grows from a sprout to maturity in less than two to three weeks when the ambient room temperature of 65 degrees is maintained. This is a plant that can grow more than two to three feet at full maturity. Then, there’s the aloe vera plant. From the moment it begins to sprout, it spread its leaves. Aloe vera is a succulent like the Jade Plant that also has no fear of fast growth. It’s long lived and grows up to five feet. There’s the Ti Leaf plant. Ti Leaf simply can’t resist growing to ten feet tall with thick, lush green leaves in less than six months. Little wonder this has always been the source of traditional Hawaiian hula skirts. The leaves grow up to twelve inches from a single thick half inch stem. Another vine plant that takes off in all directions in growth is the velvet-leaved purple passion plant. However, nothing grows faster than bamboo. From a single shoot, an indoor gardener can end up with a bamboo forest in less than six months. Be aware that bamboo plants are invasive. Given an opportunity or the proximity to other plants, it can become greedy about sharing indoor garden space. Plant it away from your prized indoor plants. Ficus trees take a bit more time to get the hang of growing indoors. These are trees that are the crème de la crème of indoor plants. Along with hibiscus, ficus trees are popular for their outstanding showy displays of foliage and color. Once these two indoor plants are accustomed to stable room temperatures and sunlight, they grow fast. It’s easy to create a desert decor with indoor plants. You’ll need a square plastic tray about 12″ long by nine inches wide. Fill with a mix of sand and potting soil, well blended. Add rocks and pebbles no larger than the size of lemons. Plant Lithops, also known as Pebble Plants, and Hens and Chicks plants in the tray for an instant mini indoor desert. Cactus is another variety of indoor plants that grow quickly and provide a rustic look to rooms. Christmas Cactus is especially colorful, but requires a bit of special care to make it bloom. Stop watering this plant in September of every year and place in a dark room or cover it to keep out light. By December, this plant will bloom with fuchsia, pink or white flowers. It’s possible to create a low maintenance herb garden in a wide, deep container. Fill the container with potting soil. Toss lavender and rosemary seeds atop the soil “carelessly” and let it grow. Plant curly parsley with oregano and thyme for an interesting fast growing indoor garden. Purple sage, basil and dill are others that grow together quickly in containers and capture attention. Ferns are another choice of fast growing, low maintenance indoor plants. Asparagus fern grows fast and has a tropical appeal. Boston ferns look great in large containers set into a high pedestal stand. For indoor gardeners, some ferns don’t need a lot of sunlight. These are ideal for shady corners of a room. For more information on growing ferns, visit amerfernsoc.org. Areca palms are among the most popular indoor palm trees that grow without much care and flourish. Visit to view the selection of palms for indoor gardens. For a more colorful palm, choose the Flame Thrower Palm with its red tipped palm fronds. Lipstick palm is nice for its symmetrical shape. Of the most common fast growing indoor plants, the Peace Lily offers pretty white flowers with a subtle scent. Aglaonema or “Chinese Evergreen” is one of the variegated varieties of fast growing plants. The Madagascar Dragon Tree looks like a miniature palm tree with spiky green leaves. Philodendrons are practically a traditional “must have” indoor vine plant that can grow quickly to more than six feet in length. Sansevieria or “Snake Plant” grows taller when placed in a long, cylindrical planting pot. The leaves of this plant can grow to more then two feet in vertical length. Miniature roses will grow fairly quickly and provide lots of color. However, the flowers of these indoor plants are relatively short-lived. Diffenbachia is another of the common, fast growing indoor plants that have lush, deep green or variegated leaves. Be aware that some indoor plants are toxic to humans and pets. Others like Diffenbachia, Snake Plant, Areca Palm and Peace Lily have other advantageous qualities. These plants filter impurities from indoor air. 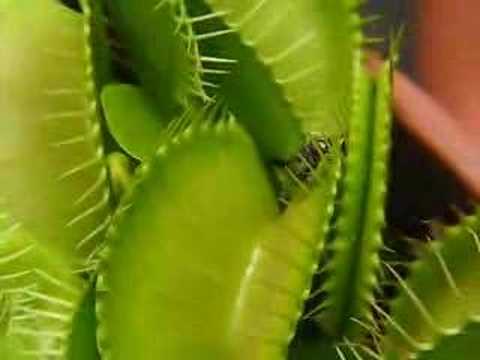 Venus Flytrap is said to trap insects in its leaves. Mosquito Geraniums repel mosquitoes. While the Giant Starfish Flower springs forth from a cactus like base, though it’s not related to cactus.